Objective: Access to dialysis treatment and the types of treatments employed in Australia differs by Indigenous status. We examined whether dialysis treatment utilisation in Indigenous and non-Indigenous Australians also differs by gender. Methods: Using registry data we evaluated 21,832 incident patients (aged ≥18 years) commencing dialysis, 2001-2013. Incidence rates were calculated and multivariate regression modelling used to examine differences in dialysis treatment (modality, location and vascular access creation) by race and gender. Results: Dialysis incidence was consistently higher in Indigenous women compared to all other groups. 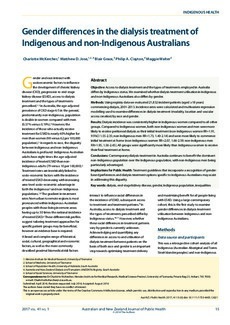 Compared to Indigenous women, both non-Indigenous women and men were more likely to receive peritoneal dialysis as their initial treatment (non-Indigenous women RR=1.91, 95%CI 1.55-2.35; non-Indigenous men RR=1.73, 1.40-2.14) and were more likely to commence initial treatment at home (non-Indigenous women RR=2.07, 1.66-2.59; non-Indigenous men RR=1.95, 1.56-2.45). All groups were significantly more likely than Indigenous women to receive their final treatment at home. Conclusions: Contemporary dialysis treatment in Australia continues to benefit the dominant non-Indigenous population over the Indigenous population, with non-Indigenous men being particularly advantaged. Implications for Public Health: Treatment guidelines that incorporate a ecognition of genderbased preferences and dialysis treatment options specific to Indigenous Australians may assist in addressing this disparity.